At age 81 Maria Risiba — affectionately known as Mhani Miroho, or Mrs. Spinach — is the elder stateswoman of Hleketani Community Garden. She is an expert on indigenous food plants as well as the three varieties of spinach grown at the farm. 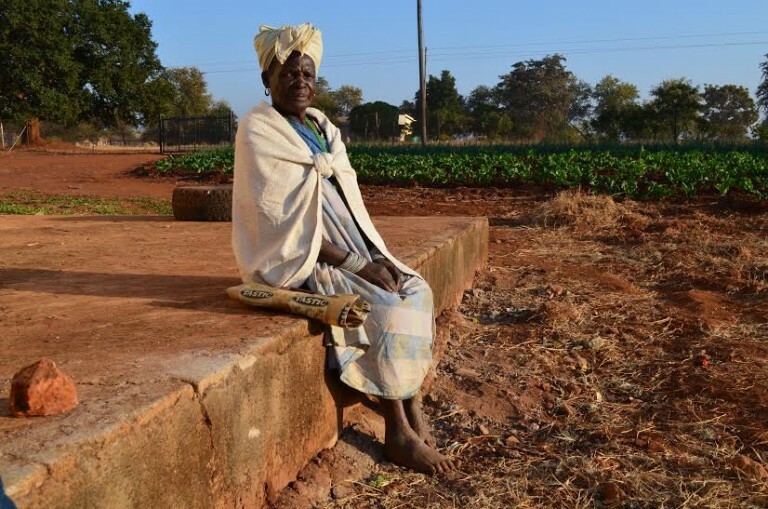 Roughly 79 years old, Mmamaropeng Sekgobela recalls a long life of farm work. For many years she and her husband worked as labour tenants on a large commercial farm. Mhani Mmamaropeng was happy to come to Hleketani garden and work for herself. She keeps an important collection of heritage seeds. Josephine Mathebula is one of the youngest women currently working at the farm (52). Mhani Josephine chairs weekly meetings and is a driving force of the farm – in addition to selling firewood and helping to support a household of seven. Sara Manwaoko Mookamedi, 68, is a founding farmer and ‘the professor’ of the farm. Mhani Sara explains that work at the farm has created a strong community of women who ‘can stand up for our rights … We can do it for ourselves.’ She cares for two orphan grandchildren among others. Like Mhani Maria and Mhani Mmamaropeng, Mihlava Nkuna is a founding farmer at Hleketani. Age 75, Mhani Mihlava helps support seven family members, including grandchildren, through her work at the farm. Mamayila Mkhawana, 63, works as an artisan producing beautiful beadwork in addition to her daily work at Hleketani Community Garden. Mhani Mamayila’s warm sense of humour keeps the laughter flowing in the field. Modjadji Nghomankulu is rarely seen at the farm without her wee grandson in tow. Mhani Modjadji’s hard work helps provide fresh vegetables for a household of eleven, including five grandchildren. Mijaji Ndlovu is treasurer of the farm. She is very worried that young people cannot find work, and is convinced that if only they get an opportunity, they will ‘grab it with both hands.’ Her children worry she works too hard at 74, but Mhani Mijaji says working at the farm keeps her fit and healthy. Sara Mookamedi, 63, has been at the farm since its founding and helps support a household of five, including her elderly mother. Mhani Sara’s quiet hard work is a steady contribution to the flourishing of the farm. Selina Shokana joined the farm when she found herself in charge of her household and with little means of material support. When not hoeing in the garden, Mhani Selina works at stitching beautiful embroidery pieces for Kaross Textiles. Evelyn Nkuna replaced her aging mother at the farm in the late 1990s. Evelyn, 55, was among the early generation of village girls to attend school . A strong student, she dreamed of becoming a teacher but was unable to finish college because of lack of resources. Mhani Evelyn has special knowledge of seed saving and heritage seeds. Daina Mahlaule is a founding member of the farm, and also helped found Khataza crafts collective in the village. Mhani Daina, 68, explains that Hleketani is a women’s farm because the women wanted to demonstrate that they could stand on their own. She has sharp insights on the deepening impacts of climate change. Alice Kgamedi, 56, is a farmer in addition to ‘the doughnut lady’ at the local middle school. Mhani Alice rises in the middle of the night to make dough, starts baking at 6 am, and sells doughnuts every morning before coming to the farm for a day’s work. Mthavini Baloyi is currently acting indhuna (village headperson). In spite of those additional demands Mhani Mthavini is at the farm every day, working hard to produce vegetables for her large household and the wider community.